Home › Places & green spaces › Roll up your sleeves and join us for Clean Up Australia Day 2014! Have you ever wanted to “give back” to the beautiful wetlands at Sydney Olympic Park? These beautiful natural areas unfortunately have rubbish carried into the area from road runoff, stormwater drains and high tides from the Auburn, Strathfield and Lidcombe areas. We have installed six stormwater booms to collect this rubbish but rubbish often overtops the booms during heavy wind or rain and can become lodged in our mangroves. We are organising two opportunities for you to get involved in Clean Up Australia Day to help keep these wetlands clean! Do you work in the Park? Join us between 8am and 9.30am on Tuesday 25 February for a business community clean up of Haslams Creek. Meeting point is the northern water feature, near Allphones Arena. Are you free Sunday 2 March? This is the official Clean Up Australia Day and we are cleaning up in Bicentennial Park. 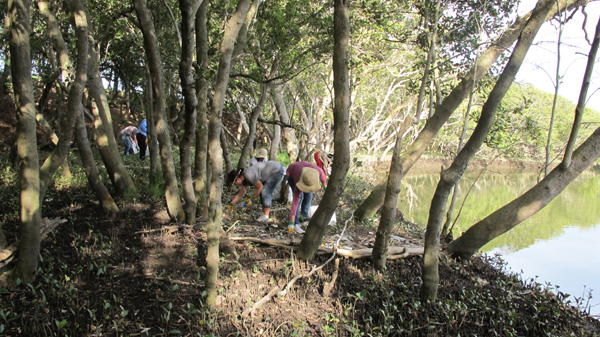 Join us between 9am and 11.30am to clean up the mangrove area for the wildlife that call it home. Meeting point is the Heron Pavilion in Concord West, access is via Victoria Avenue with parking onsite. Both events will include a bite to eat afterwards as a thank you for your efforts. We hope to see you there!